Lauren Oliver is best known as an author who writes for teenagers, but this new novel is a work of fantasy for younger readers involving talking animals in a dangerous underworld. 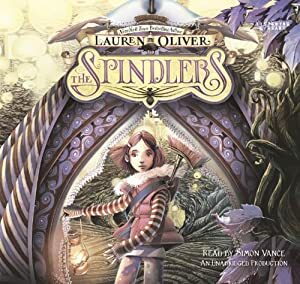 Liza is the young heroine, setting out to rescue the soul of her younger brother Patrick, which has been captured by terrible spider-like creatures call the Spindlers. Liza is helped by a rather prim but still smelly rat called Mirabelle, wearing a wig and make-up. Together, they meet many different other creatures who help her on her quest to find Patrick's soul. Many of the characters and monsters seem rather familiar, bringing to mind Alice in Wonderland and Greek myths, but there is enough variety to keep them interesting. Some of the dramatic episodes go along rather simple lines, making the book feel aimed primarily at very young readers. On the other hand, the story is violent and disturbing enough to make it seem inappropriate for that group. Parents will certainly want to browse through the story rather carefully first before giving it to children who are sensitive to stories about threats to family members and place children at great risk. The book shows plenty of imagination, and has some moments of great creativity, but they all go rather quickly, and themes are not explored in any depth. Fans of Lauren Oliver's previous work are likely to miss the thorough exploration of surprising themes that makes her Young Adult novels so interesting. The unabridged audiobook is performed by Simon Vance, a well-known British reader. It is an odd choice since he is not very good at an American accent, so while he is good at all the animal accents, who have different varieties of British regional accents, Lisa and her brother are not very convincing. Some listeners may be perturbed that he gives the Spindlers, the villains of the story, Welsh accents, when the text gives no indication they sound like that. But it is a performance with lots of vigor and character, and Vance makes the different characters memorable.